According to the Abbey chronicler, in the year 948, Abbot Ulsinus (or Wulsin) built the the churches of St. Peter, St. Stephen and St. Michael at the entrances to the town. The chronology of the Saxon Abbots is difficult to establish but the recorded sequence makes more sense if Ulsinus abbacy was earlier than 948, with a floruit for him of 860-870. However, the core both St. Michael's and St. Stephen's consists of a Late Saxon Church of remarkably similar size and plan. Although it is perhaps possible that these churches could date from 948 a later date around the end of the 10th, beginning of the 11th. century seems more likely. Of course the earliest existing work may not be the earliest church and at St. Stephen's excavation has suggested that there may well have been a timber structure preceding the Late Saxon church although the purpose of this remains uncertain. Plans showing the earliest phases of St. Michael's and St. Stephen's and how a similar sized church would fit the plan of St. Peter's. The original Late Saxon church, built c.1000 consisted of a nave and chancel. In Norman times the church was enlarged with the provision of aisles to the nave; the northern being the first built. In the Thirteenth century the Lady Chapel and probably the south porch were added. Lancet windows of the Early English style were used in the chapel and also in the clerestory of the nave. In the Fourteenth century the the east wall of the chancel was rebuilt (the present window in Decorated style is a modern copy) and parts of the side walls wee also rebuilt. The chancel arch was rebuilt and later in the century the western window in the south wall was inserted. Three of the lancets in the north clerestory were replaced in the early Fifteenth century and were probably the work of Thomas Wolvey the architect of the St. Albans clockhouse. He was also responsible for the Fifteenth century tower (which may have replaced an earlier one) unfortunately demolished at the end of the Nineteenth century. Wolvey is buried somewhere in the church. Later Fifteenth century windows occur in the south wall of the lady chapel and internally at its north east corner is the blocked stair leading to a rood loft. Set above this loft, partly on wooden boards infilling the top of the chancel arch, a picture of the Doom (the Last Judgement) was painted. Other Fifteenth century windows occur in the south wall of the chancel and in the north aisle (2). The church was restored in the later Nineteenth century, carefully by Sir Gilbert Scott and with enthusiasm by Lord Grimthorpe. The latter modified the church by demolishing the tower and extending the nave to the west. A new tower was built at the west end of the north aisle. A new vestry was built where the south aisle had once been. Another vestry was added to the north side of the church in 1937. 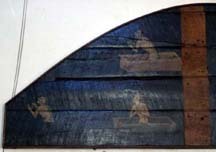 In 1808 a Fifteenth century painting of the Doom was discovered over the chancel arch and on boards infilling the top of the arch itself. Unfortunately only the portion painted on the oak boards survives but this is an extremely rare survival. Fortunately a drawing made at the time of discovery records the missing portion of the painting so that the alternatives of salvation or damnation gazed at by the medieval congregation can still be appreciated. One of the three churches which the Abbey tradition claimed were built by Abbot Ulsinus. Like the two other of his churches this served a large rural parish but also provided for a large part of the town. (An area much larger and more populated than that part of the town in St. Michael's parish). This church has been much more drastically altered than St. Stephen's and St. Michael's. By the end of the 18th century it was in a very bad condition and in 1799 part of the tower was taken down; in 1801 the belfry floor collapsed and in that year the transepts were demolished and the chancel shortened. The existing building results from the "indefatigable" Lord Grimthorpes "restoration" of 1893. However it is clear that in the 15th century it was much bigger than the other churches with a cruciform plan with large transepts and along eastern arm; very much a town church. The parish originally included, as chapelries, Sandridge, St. Andrew (in the town) and Ridge, which were made into separate parishes in the 14th century. In 1119-46, Abbot Geoffrey granted the use of the church revenues to the Abbey Infirmary and in 1252 Abbot John instituted a vicarage. The Infirmarer then became rector and as such was required to supply the monks wine from the revenue of the church. If he failed in this obligation he was fined 8s. (40p.) for each day missed! 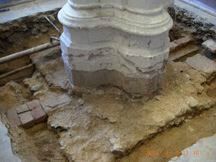 In 2001 a small excavation was undertaken which showed that one of the Fifteenth century columns sat on a possibly earlier foundation, which itself cut an earlier east-west wall. This wall was probably the original north wall of the nave and therefore probably of Late Saxon date although there was no direct evidence for its date. St. Stephen's followed a similar course of development to St. Michael's. The original late Saxon building consisted of a nave and chancel to which aisles were added but here the south aisle was not added until the Thirteenth century and was integral with the building of the lady Chapel. The north wall of the north aisle has been located by excavation, although little of it remained. This was not dated but as the church was consecrated between 1101-1118 it was almost certainly built before that date. This north aisle was demolished in the Fifteenth century. Left - The north wall of St. Stephen's showing a Late Saxon Window cut by the arcading of the added Norman aisle. The modern extension is entered through a Fifeenth century doorway built after the demolition of the aisle. An oratory to St. Germain (or Germanus) of Auxerre was built in the time of Abbot Eadfrith (c.840-860). This is said to have been built on the site of a chapel, then ruinous and deserted, which had been built where the house was in which St. Germanus stayed in 429 during his visit to Verlamium to combat the Pelagian heresy. Wulf a Dane was installed as a hermit and was suceeded by Eadrith after his resignation from the abbacy. The Chapel was dedicated in 1108-15 and was repaired in 1326-35. It seems likely that the survivng fragment of Roman city wall known as 'St. Germains block' owes its survival to the fact that it was once incorporated in this chapel. At the dissolution the chapel along with Mary Magdelene passed to Sir Richard Lee. This oratory was built by Abbot Wulsin (c. 860-880) and a chapel of St. mary Magdalene was dedicated in 1094-1119. There was still a hermit in residence in 1530. After the dissolution the property was described as a chapel with a mansion and land adjoining, it was leased to Sir Francis Bryan in 1541 and granted to Sir Rivchard lee in 1547. Three of the Abbey's daughter houses or cells were situated close to the town. The priory of St. Mary of Sopwell was said by Matthew Paris to have been founded by Abbot Geoffrey (1119-46) and this house was probably established to house the nuns who had existed at the Abbey itself until around this date. In 1428 the famous robber captain William Wawe and his band broke into Sopwell expecting to find there Eleanor Hulle a lady of some influence at the royal court. While they were plundering the hue and cry was raised by a man in the "village". This suggests that there was occupation near to the priory presumably at its gates, on Sopwell Lane outside the town, or at Greenlane End. In 1537 the house was dissolved under the Act of the previous year and the site was granted to Sir Richard Lee. He adapted the buildings for domestic use but later built a new house on the site. It is the remains of this house which are known today as the Nunnery Ruins or Sopwell nunnery. The "barns of the cell" with which the priory's agricultural land was provided are still remembered in the Cell Barnes area of St. Albans. The Hospital of St. Mary de Pre was founded by Abbot Warin who in 1194 granted to the monastery the place in which their church was built together with the conventual buildings on either side of Watling Street. Its cemetery was consecrated in the period 1214-35. At first Pre was ruled by a Master and was a hospital for leprous nuns but as leprosy died out its role changed and it became an ordinary priory in the mid fourteenth century. In 1528 an inquiry found that the prioress had died and that the three nuns which comprised the convent had left. The priory was dissolved by Pope Clement VII and annexed to St. Albans Abbey, then held by Cardinal Wolsey. In the July Henry VIII granted the site of the former priory and its lands to Wolsey himself who conferred it on his new Oxford college. After his downfall Wolsey's lands were seized by the king and Pre was leased to a London merchant and in March 1530, for a term of 30 years, to Richard Raynshaw, yeoman of the King's Guard. In 1531 King Henry swapped Pre with the Abbot of St. Albans. When the Abbey was dissolved the site of the priory was granted to Sir Ralph Rowlatt. The site of St. Mary de Pre has twice been disturbed by the digging of pipe trenches which revealed wall foundations and the outlines of buildings show on aerial photographs. One of the buildings remained standing until well into the Eighteenth century. The Hospital of St. Julian, for leprous men, was founded by Abbot Geoffrey (1119-46) on a plot of land along side Watling Street known as Kingesho. King Henry II granted the lepers the sum of 1d a day in perpetuity and from 1160 the annual sum of 30s 5d was paid to them by the Sheriff of Hertfordshire. in 1344 it was decreed that in future there should be 6 lepers and priority was to be given to monks of St. Albans and those born within the jurisdiction of the Abbey. Married men were only admitted if also adopted a religious life, so freeing the husband from the tie of marriage. In 1505 after a dispute over the mastership of the hospital it was annexed to St. Albans. Nothing is known of the archaeology of this hospital but there is in the St. Albans Museums collections the skeleton from a burial found during building works close to the corner of Vesta Avenue and Watling Street which no doubt came from its cemetery. The name St. Julians is still in use as an area of the modern city.